Successful layered outfits follow simple rules. Even if you don’t know exactly why it looks good, your eyes will pick up on things like complementary colors and silhouettes. These types of details amount to a complete outfit, more than the sum of its parts. Since this skill is vital in the workplace, read on to learn more. You’ll add variety to your office style and get more outfits out of clothing you already own. Every element is an opportunity to incorporate new textures or patterns. It’ll also keep you warm in cooler weather or when the notorious office AC is blasting. Need we say more? We’ve walked through the basics below. 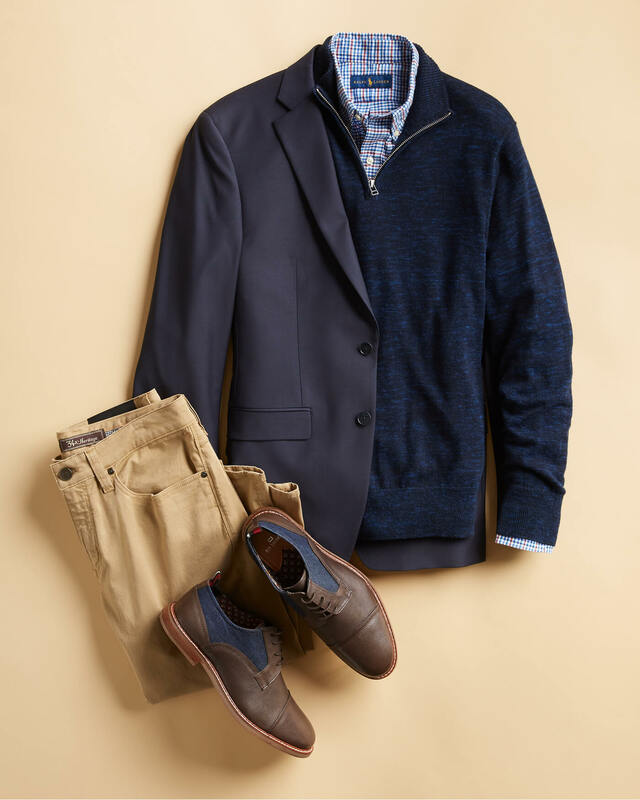 We’ll touch on pairing colors, fabrics and more to get you started. We’re not talking about the literal definition—colors on opposite sides of the color wheel—we mean finding pairs that work together more broadly. Tonal dressing—incorporating shades of the same color into a look—is the easiest approach. Everything tends to go together when you stay in the same color family. Use “color badges” like a blue pocket square worn with a blue tie. This works for patterns, too. 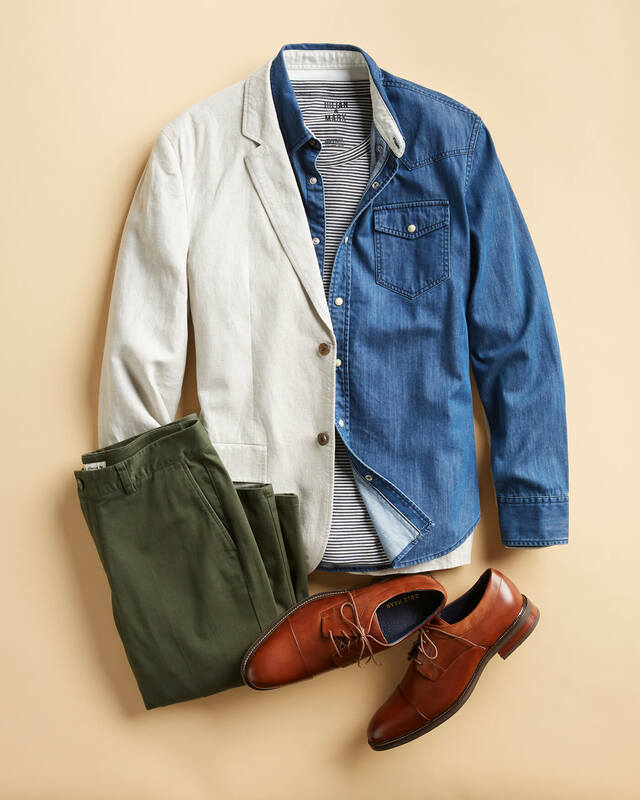 Live by “The Rule Of Three”: On your way to becoming a layering expert, try not to mix more than 3 colors or your outfit may end up looking busy. The type of fabric you wear should also be taken into consideration. You don’t want to add unnecessary bulk to your look. Thicker fabrics are heavier and add visual heft. If you’re a bigger guy, consider lighter materials that won’t add more weight to your frame. On the other hand, a slimmer guy might want to broaden his frame. Adding thicker fabrics can help offset a slender silhouette. Patterns such as gingham and stripes as well as textures like corduroy and linen are another way to work interesting elements into your everyday rotation. We know patterns are exciting. Try starting out with two, and once you get the hang of it, you can mix as many as you want. Patterns really shine as great accents, especially if you’re wearing mostly solids. Picture a navy sweater with a pinstripe shirt collar. Win, win. Melding texture into your look is another way to add in eye-catching layers since it breaks up pieces that are otherwise similar in color and could look flat. Here are a few outfits we think fit the bill in the inspiration department. Go for your favorite mashups, from formal to casual, and start layering. This is a great example of how utilizing prints can break up an otherwise monochromatic look. 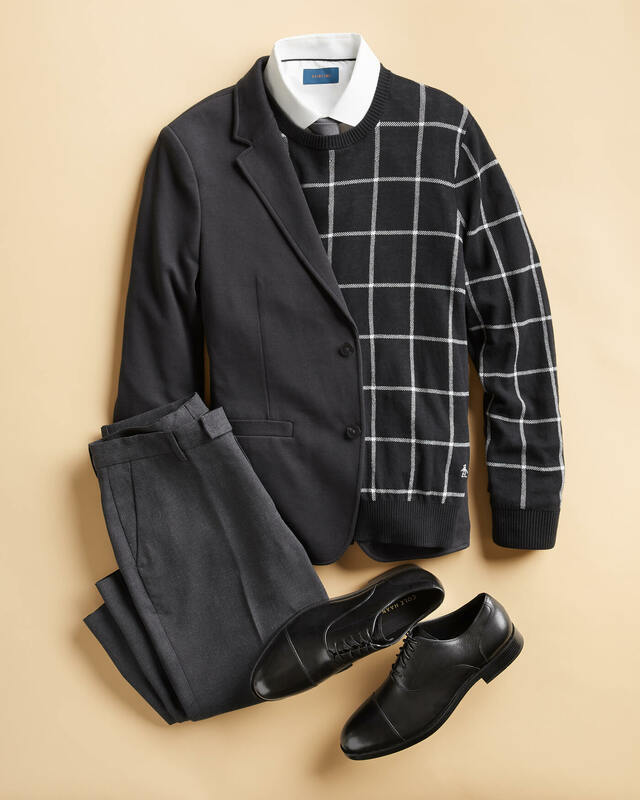 The windowpane of the sweater acts as a “color badge” (see layering tips above) with the white shirt, while the white shirt provides a nice contrast to the dark gray suit. It has traditional and dressy elements but is still modern. 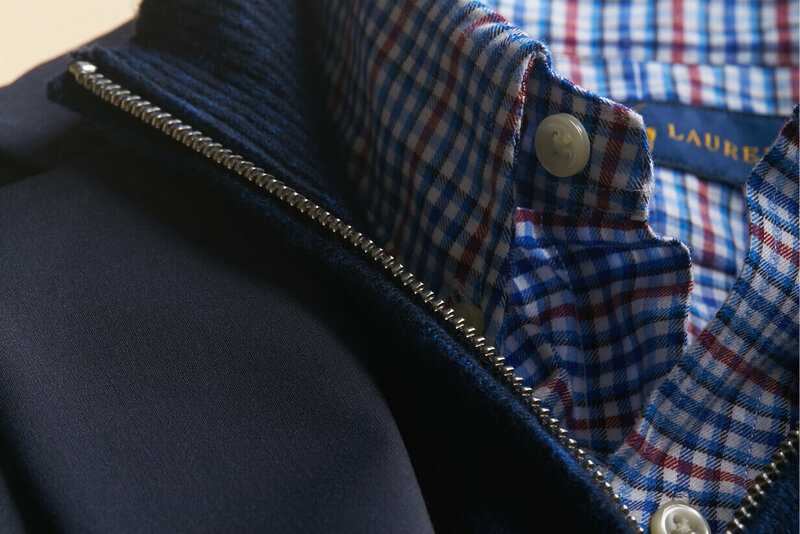 Here, you’ll find shades of blue working with each other, from the texture of the navy half-zip and the gingham patterned shirt down to the fabric on the shoes. The brown leather plays well with the khakis and complements everything else since blue and brown hues are best mates. It’s casual yet put-together. A casual work environment is a place to test your skills and experiment. The navy striped tee goes well with the light blue denim shirt and white blazer—one borrows color from the other. The chambray shirt adds texture and detail to the look with snap buttons and a front pocket. Working in dark colors or neutrals with the pants and shoes round out the look. It’s relaxed but well executed. Now you have the knowledge to start layering your office looks. We know it’s a lot to take in, but it will become second nature with practice. Follow these guidelines, and you’ll be on your way to expert layering in no time. Let us know what you think in the comments below. Ready to try it for yourself? Tell your Stylist you want layers for work in your Fix!